You may not believe me, but I do have a kind of plan for where this page is going and what order I'm going to do stuff in. I've got a little notebook and everything (very reasonably priced, 79p from Sainsbury's). But then something comes along that makes me stop and shove something in that I'd forgotten about or was saving for later. Partially because a chap called "cambridgemartin" linked to this blog from something called the Panic Club board and said it was great except for the upcoming band and partly because I'd forgotten that the featured mp3 is of one of my favourite football-metaphors-for-life records (right up there with Mathematically Safe by Half Man Half Biscuit). So ladies and gentlemen, please be upstanding for Thousand Yard Stare! Hailing from the much-maligned industrial wastelands of Slough, Thousand Yard Stare banged out a succession of pure jingly-jangly indie pop EPs of the finest quality for four years or so in the early 1990s and were right up there in the pantheon of the country's finest exponents of energetic dancey sing-a-long music that we love so much. This particular football-metaphor-driven ditty, Thousand Yard Stare - 0-0 AET featured the talents of Martin Bell of The Wonder Stuff on fiddle, topped the Indie music charts and even made its way onto the UK top 40 singles chart. I'd forgotten just how good Thousand Yard Stare were and I'm sorry it took so long to get them in here; but it was all part of the masterplan. Promise. I guess it should be pretty obvious that I'm a big fan of scratchy old indie records by now. What is probably less obvious is jus thow much I love flexi disks. A couple have snuck in already from The Family Cat and A House, and these are absolutely my favouritest things so far. It's pretty fair to say that if I had a load of money and nothing better to do then I'd get completely obsessed with them. Just take a look on ebay and see how much cool stuff there is. Anyway, suffice to say when I found this combination of Galaxie 500 and top notch 'free off of a magazine' flexi disk I was as happy as happy can be. This particular flexi was given away with a magazine called "The Catalogue" which I have to admit I'm not familiar with and comes with another tune from a New Zealand band called "Straitjacket Fits". Anyway, I digress. Galaxie 500 were part of the late 80s American shoegazing invasion and owe more than a nod (in this recording at least) to bands like Spaceman 3. For a couple of years the band swirled around the UK, banged out a Peel Session and made a lot of friends, not least Liz Phair who cited them as an influence. Unfortunately Rough Trade, their label, went bust in 1991 and that rather spelled the end of the band in the UK at least. There's some really good stuff available here and an mp3 of the flexi here in all it's scratchy plasticky wonderousness - Galaxie 500 - Victory Garden. Ok, so this is going to be slightly different as it's more of a treasure hunt for information from anyone that can help. What we have here is a a 1-sided 7" in a natty brown carboard sleeve with an insert promoting a few gigs, but that's it really. According to the only bits and bobs I can find about the internet it may well be a freebie sent out to fanclub members and is probably called "Mouse in a Hole", although during the warm up bit of the track the chap (presumably the aforementioned Gem) calls it "Tell Your Ma". The various copies on eBay seem to be being sold by people who don't know either. I do know that Heavy Stereo were the stepping stone band for Gem Archer, current guitarist with the Oasis boys. I'm not too worried that this is edging into Brit Pop territory (shudder), as we've already had Ride and Andy Bell. 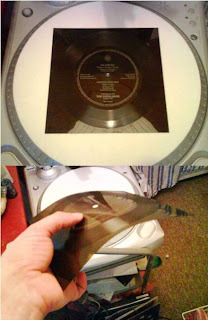 What I'd like to know is this: What is the bit of vinyl is pictured? Is it Mouse in a Hole? How did the fanclub get it? Is it a 5000-only limited run or similar? Did you see the band play? I picked it up in a charity shop as it was right next to the first Sleeper EP (of which more later) and for a pound it seemed like a proper bargain. It's nice late-indie with a smattering of rock and more than a hint of the Oasis sound. So this is the mp3 of it Heavy Stereo, but what?, help! 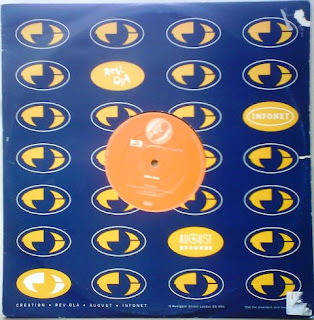 I was reminded of Bang Bang Machine when I was doing the Catherine Wheel post down there, so had to rush off to ebay and spend some hard earned (well, adsense-earned) cash on this particular 12". Partially because it turns out it was one of the last records the band released, partially because it was released in 1995 and that's the first missing year from the 90s in this blog so far, but mostly because it's an absolute cracker of a record. So who were Bang Bang Machine? Well, they were only Worcestershire's finest purveyors of the indie-pop, jingly-jangly, shoe-gazing type of music that we all know and love. Actually, that's a bit unfair; the band experimented with various musical styles from proper indie pop to grunge to, well, goth really and towards the end of their existence firmly fell into the Brit Pop category. The band's indie pop pedigree can't be denied of course, a Peel session and number 1 in the 1992 Festive 50 above such lumiaries as Pavement, Jesus and Mary Chain, The Wedding Present, Sonic Youth and The Fall attest to that, and if you've got a copy of Geek Love (said number 1) on CD, then that's worth about £20 on ebay to you guv! 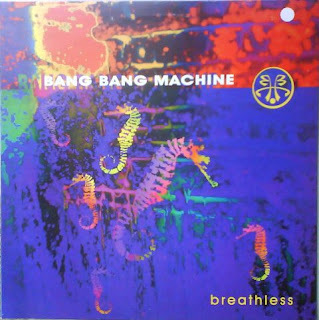 There's a nice unoffical site here and for your listening pleasure, here is Bang Bang Machine - Breathless. I think this post is going to be one of those where everyone remebers far more about the band than I do. This is probably due to an excess of snakebite in the early 1990s than anything, so please fill in the gaps! If ever there was a Scottish indie-pop super group, then it's these chaps, the BMX Bandits. Containing, in no particular order or time frame, members of Teenage Fanclub, The Soup Dragons, Arab Strap and Eugene Kelly out of Captain America/Eugenius, not only do the group give me loads more names that I'd forgotten to include, but it also provides a collection of some of the most talented musicians of the generation - and all are from a little bit of Scotland near Glasgow. The problem of course with putting up such a well-regarded, if not particularly commecially-successful band is that there are lots of places around the web for them, probably the best being The unoffical tribute to the BMX Bandits. "Oasis did their first UK tour dates supporting the Bandits as a favour from Stewart to Creation label boss Alan McGee. BMX Bandits admirers include Kurt Cobain who was famously photographed wearing a BMX Bandits T shirt as he had been wearing T shirts of Daniel Johnston and Captain America (later renamed Eugenius) and Cobain claimed on a New York radio show that if he could be in any other band it would be BMX Bandits."